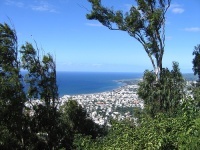 Reunion's small but spirited capital is Saint-Denis, a picturesque town flanked by three mountains and situated at the mouth of the Saint-Denis River. Saint-Denis is a mixture of sophisticated French-style restaurants, bars and nightclubs, and more traditional sights and sounds. Sadly, it is often sidestepped on trips to the island, used merely as a starting point due to its close proximity to the airport. However, it is well worth taking some time to explore its charms before moving on. The chic, upmarket seafront area with its lovely promenade is known as La Barachois, and remnants of the small port that once existed can be found here including an old warehouse of the East India Company that now houses the French Administration Offices. The Grande Marche (market) is a treasure trove of Malagasy arts and crafts, fragrant spices and textiles, while smaller markets offer mouth-watering fresh tropical fruits and vegetables. A distinctly French flavour mixes with African, Chinese, and Indian, creating a rich mélange that is evident even in the cuisine. Try a delicious cari (a meat or fish stew cooked in a sauce and eaten with rice) and rougail (a spicy tomato salsa), sample some excellent Chinese food from a tiny take-away or indulge in juicy mangoes or litchis off the stalk. Saint-Denis boasts a fascinating mix of religious architecture including mosques, Tamil and Buddhist temples, and a cathedral, illustrating the cultural diversity of the island. There are several quaint old buildings, an interesting Natural History Museum, a modern art museum named after the poet Léon Dierx, and the facades of old East India Company buildings. It is also well worth getting out of town and climbing one of the three surrounding peaks for a gorgeous view. Perhaps the most breathtaking is from Route de la Montagne (the Mountain Road), a steep track that winds up to the top of a lava cliff that drops dramatically into the sea. Once the delights of Saint-Denis have been explored, the rest of the island paradise of Reunion awaits.